Ford Wesleyan Methodist Chapel and Sunday School were located on the northern side of Cambridge Road. There have been three Chapels on the site. Ford Wesleyan Methodist Chapel and Sunday School in Cambridge Road. Saint Mark's Church and Ford and Cambridge Road Schools are also shown. From Ordnance Survey map CXXIII.3, surveyed in 1912. The history of the Wesleyan congregation at Ford starts when Mr Richard Andrews and Mr John Ellis began a Sunday School in Clyde Street. Later they moved into two rooms in a property in Alexandra Road, where one room was used for the Sunday School and the other for the services. A site in Cambridge Road was then acquired upon which to erect their own chapel. A minister who visited the site later wrote about the dedication of the local men, who after they had spent their day at labour came to the site in the evenings and quarried the stone and levelled the site. One New Year's night they even held a watch night service in the open-air with only lanterns to provide light for reading the hymns and prayers. The foundation stone of the Ford Wesleyan Methodist Chapel was laid on Friday July 22nd 1864 by the Mayor of Devonport, Mr Charles Row. The building was to be erected by Mr Jenkins of Devonport in a simple Gothic style and was expected to cost around £500. It would be 45 feet in length and 36 feet in breadth, with pointed windows and a plastered front. The timber roof was to be stained and varnished. The remainder of the space behind the Chapel, measuring 27 feet by 14 feet, will be occupied by schools and minor offices. After the ceremony a tea was given in a field alongside the site of the Chapel but the weather was not too kind, unfortunately. Some £290 was collected at this event. Although a Sunday School building was provided it was soon found to be too small to accommodate the 200 children who were attending it every Sunday. A new building was therefore required and on the afternoon of Wednesday July 10th 1872, in pouring rain, Mr G T Rolstone laid the memorial stone of the new premises. Gothic in style, like the main Chapel, it was designed by Mr Morshead, architect, of Devonport, and to be erected by Messrs Martin and Patey, of Stoke, at a cost of £500. The ground and first floors each measured 50 feet by 20 feet 6 inches. The boys would be taught on the ground floor and the girls on the first floor. It was anticipated that 400 children could be accommodated. The Sunday School was due to be opened in December 1872. The ceremony was followed by tea and a public meeting to raise more funds. As usual in those days, the congregation outgrew the accommodation and in 1904 the decision was taken to erect a new building. With the site purchased and paid for and some £500 in the bank, Mr H J Snell, the architect, was engaged to prepare the plans. The third Ford Wesleyan Methodist Chapel. The site had a frontage of 70 feet on Cambridge Road although the inner dimensions of the Chapel itself were 53 feet by 48 feet. There were both side and end galleries and thus seating for some 800 persons was provided. Two broad staircases of stone lead to the galleries. The organ and choir were placed in a side transept at gallery level. The ceiling line was 40 feet from the ground and the open timber, arcaded roof was of pitch pine, as were the pews and rostrum. The building was constructed of limestone, with Portland stone dressings. A conspicuous feature of the Gothic style Chapel was the large central window, almost 20 feet in height, which was filled with stone tracery. 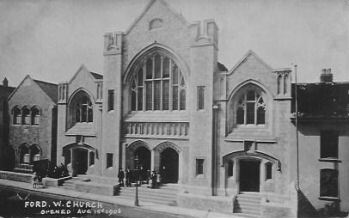 The new Chapel was opened for worship on Wednesday August 15th 1906. Mr John Connett performed the ceremony and the resident minister, the Reverend J Montgomery Pascoe, presided over the service. This Chapel lasted until the Second World War, after which it lay in ruins. It was never reopened but the congregation appears to have kept going until 1964, when records of it cease.